Well, folks, Learning Resources has done it again! They have provided my son with yet another amazing toy that is both educational and fun! (you can see how much I love Learning Resources and their other products here and here). Learning Resources has proven to me over and over why they are the leading manufacturer of innovative, hands-on educational materials for classrooms and learning toys for the home. For more than 25 years, the company has been a trusted source for educators and parents for quality, award-winning educational products. I generously received the Farmer's Market Color Sorting Set. 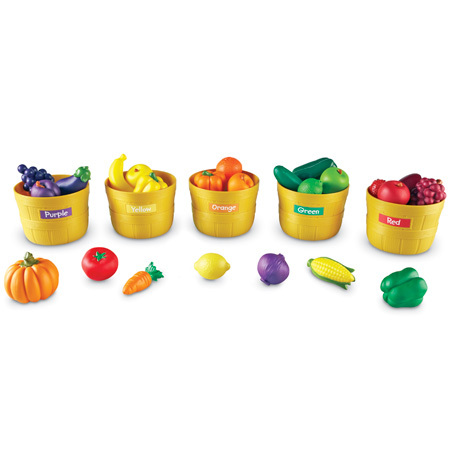 With this set, little gardeners develop color recognition and sorting skills! Children can sort and sell bushels of realistic produce and it is perfect for dramatic play and nutrition lessons too! It is perfect for ages 3-7. I think I may be Learning Resources BIGGEST fan! Their toys are some of my son's favorite toys of all time and he literally plays with a toy or item from Learning Resources on a daily basis! His latest fave toy and learning resource (no pun intended!) is the Farmer's Market Color Sorting Set! I absolutely love this set because it is not only fun to look at the different fruits and veggies and name them, it really helps him learn his colors and learn the skill of sorting correctly by color or even by fruit or veggie, when he gets really advanced! Plus, he can also use them in his kitchen set for pretend play! I love products that are both great for learning and playing and Learning Resources is an expert in providing those types of products! Buy It: You can purchase the Farmer's Market Color Sorting Set for $39.99 on the Learning Resources website. 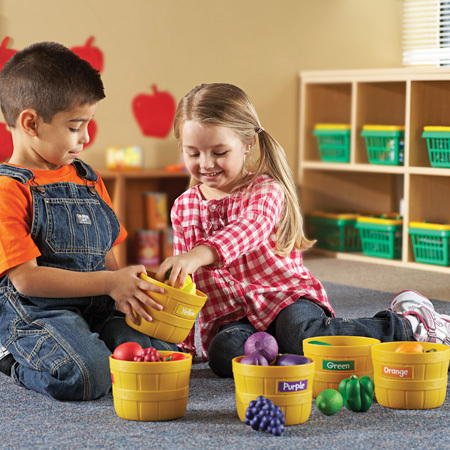 Win It: Learning Resources is generously offering (1) Farmer's Market Color Sorting Set to a lucky winner!